What qualification is required to become an Income Tax Inspector? How can I become an Income Tax Inspector? What is the salary of Tax Assistant? How do I become an Income Tax Commissioner? NOTIFICATION: Office of the Principal Chief Commissioner of Income Tax, Delhi, (Government of India) inviting online applications for filling up 35 vacant posts of Income Tax Inspector, Tax Assistant, Stenographer Grade II & Multi Tasking Staff (MTS) in Delhi Region from eligible and interested willing Meritorious Sportsperson male & female candidates. It is latest & good information for unemployed personnel those who are looking for these new Jobs in Government sector & other organizations. Job seekers, who wish to apply for these vacancies regarding Income Tax Recruitment 2019, must have passed High School /10+2 and Graduation with a required experience if asked. Applicant’s upper age should be as per Govt. rules and age relaxation is applicable to all reserved category candidates i.e.SC/ST/ OBC/Women candidates etc. PLACE OF POSTING: Delhi region. NO.OF VACANCIES: 35 vacant posts of of Income Tax Inspector, Tax Assistant, Stenographer and Multi Tasking Staff (MTS) from Meritorious Sports persons in Income Tax Department. 1. Income Tax Inspector - 01 Post. 2. Tax Assistants -18 Posts. 3. Stenographer Grade II - 08 Posts. 4. Multi Tasking Staff (MTS) - 08 Posts. 1- Income Tax Inspector: A passed of Degree from any recognized University. 2- Tax Assistants: A passed of Degree from any recognized University and must be having a data entry speed knowledge of 8000 key depression per hour. 3- Stenographer Grade II: A passed of 12th class or equivalent from any recognized Board and must be having knowledge of a dictation of @ 80 words per minute for 10 minute. And transcription 50 words per minute (English) or 65 words per minutes (Hindi) on computer. 4- Multi Tasking Staff: A passed of 10th class or equivalent from any recognized Board. SPORT ELIGIBILITY: Sports persons who have represented the Country, State, University in the International, National and Inter University (conducted by Inter University Sports Board) Tournaments are eligible to apply. Sportsperson candidates who has cleared sports event after 01-04-2014 is eligible to apply for these posts. 1. Income Tax Inspector: 18 – 30 years. 2. Tax Assistants: 18 – 27 years. 3. Stenographer Grade II: 18 – 27 years. 4. Multi Tasking Staff (MTS): 18 – 27 years. AGE RELAXATION: Relaxation in age is applicable for reserved category candidates as per Govt. 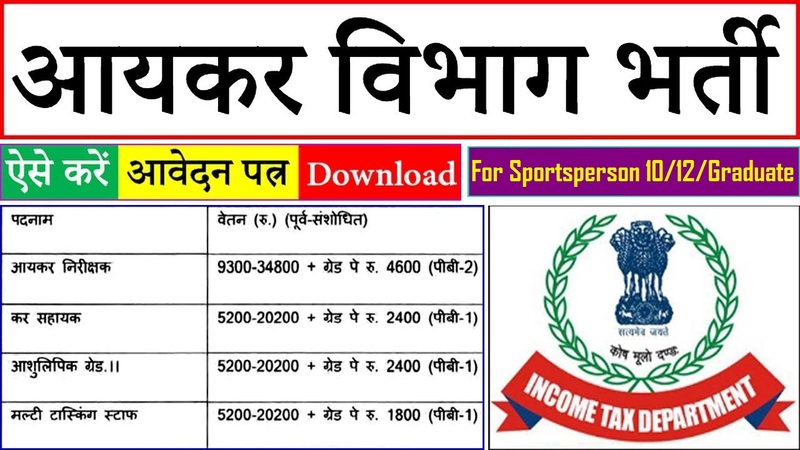 Rules for Income Tax Recruitment 2019 | 35 Vacancies Apply Tax Assistants Here. 1. Income Tax Inspector: Rs. 9300- 34800/- + GP Rs. 4600/-. 2. Tax Assistants: Rs. 5200 -20200/- + GP Rs. 2400/-. 3. Stenographer Grade II: Rs. 5200 -20200/- + GP Rs. 2400/-. 4. Multi Tasking Staff (MTS): Rs. 5200 -20200/- + GP Rs. 1800/-. REQUIRED APPLICATION FEE: No application fee is required. POST RESERVATION: Reservation is applicable for Scheduled caste (SC), Scheduled Tribe (ST), Other Backward Class (OBC), Persons with Disabilities (PWD), Ex-Servicemen (ESM) candidates. SELECTION PROCEDURE: Candidates will be selected on the basis of their performance in Screening, Physical Measurement Test, Sports Trial Test and Interview. “The Deputy Commissioner of Income-tax (Hqrs.- Personnel), Room No. 378A, C.R. Building, I.P. Estate, New Delhi-110002”. "APPLICATION FOR THE POSTS OF INSPECTOR/TAX ASSISTANT/STENOGRAPHER GRADE II/MULTI TASKING STAFF UNDER SPORTS QUOTA". 1. Matriculation/SSC or equivalent certificate for proof of age. 2. Certificate of education qualifications. 5. Copy of Aadhar card. CONTACT ADDRESS: Income Tax Department (Government of India), Office of the Principal Chief Commissioner of Incom Tax, Delhi, Central Revenue Building, I.P. Estate, New Delhi - 110002. रेलवे नियुक्ति संस्था /रेलवे रिक्रूटमेंट बोर्ड (RRB) ने 1937 पदों पर विभिन्न पैरामेडिकल स्टाफ जैसे स्टाफ नर्स, लैब तकनीशियन,हेल्थ एंड मलेरिया इंस्पेक्टर, फार्मासिस्ट तथा अन्य पदों, Advt No: CEN 02/2019 के लिए नोटिफिकेशन जारी किया है, इच्छुक उम्मीदवार यहाँ आवेदन कर सकते हैं। आवेदन करने से पहले पूर्ण अधिसूचना यहाँ पढ़ें । 1937 Paramedical vacant posts of Staff Nurse, Health and Malaria Inspector, Pharmacist, Lab Assistant, Radiographer and others in Indian Railway, Recruitment Board (RRB), Headquarters Office, New Delhi. LAST DATE TO APPLY: 07-04-2019. CONCLUSION: Income Tax Department invites online application for the recruitment of 35 vacant posts of Income Tax Inspector, Tax Assistant, Stenographer and Multi Tasking Staff (MTS) on regular basis from Indian residents who are eligible & interested; candidates can apply through online application. Candidates can download detailed advertisement/notification from official website for recruitment information like required age, reservation in age, required education qualification, required application fee, reservation for posts, syllabus, date of test, last date to apply, number of vacant posts, name of department, mode of selection, how to apply and other instructions. 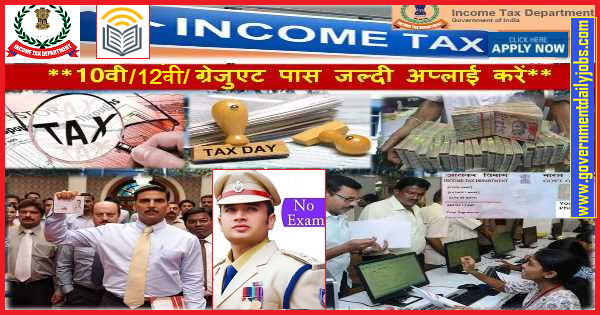 LAST DATE TO APPLY: 31-03-2019 Income Tax Recruitment 2019, 35 Assistant, MTS & Other Vacancies.